*The author would like to thank his colleagues from "The Judean Hammer", Nathaniel Feingold and Moshe Schwartz for their comprehensive research which contributed greatly to this article. Few people understand the issue better than they do, as well as the tremendous danger that the "hard targets" pose to the spiritual integrity of the Jewish people. 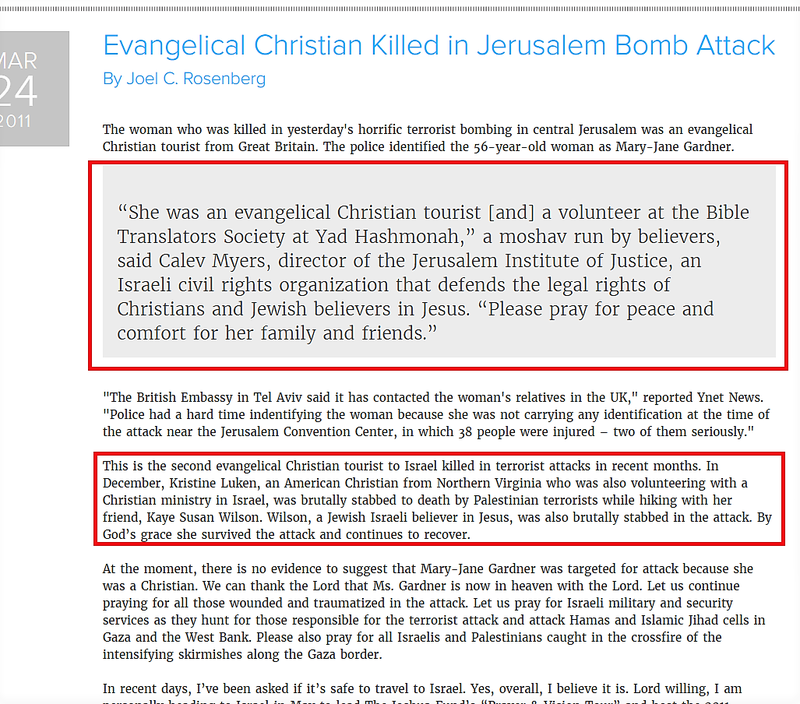 No Jewish spokesperson should ever get a pass when messianic organizations THEMSELVES repeatedly identified her as being messianic in the past. A vicious assault by Arab terrorists, no matter how barbaric the circumstances, doesn't make this history go away. 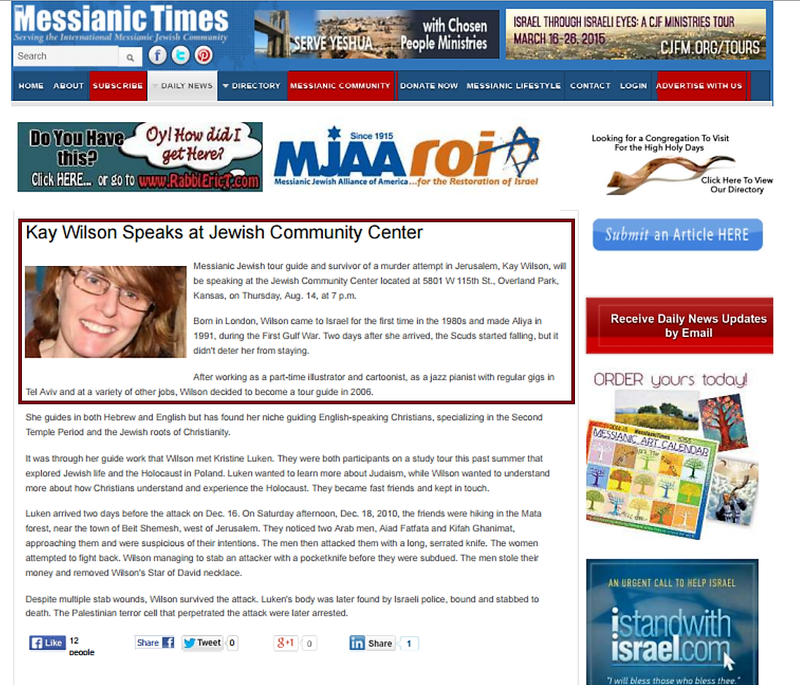 And yet today, Kay Wilson is a public spokeswoman for such hasbara groups like Stand With Us. She can speak at a Chabad House in England. 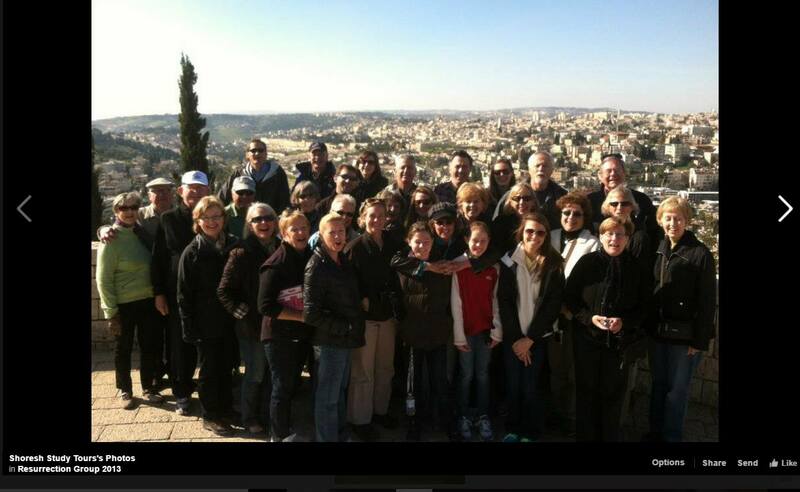 She visits Jewish schools and synagogues. She writes for Arutz Sheva. She doesn't have to explain anything at all, nor does she feel inclined to answer any respectful inquiries about her past. And when she does, it is always evasive, she avoids responding to any specific points, and she plays the defensive card. 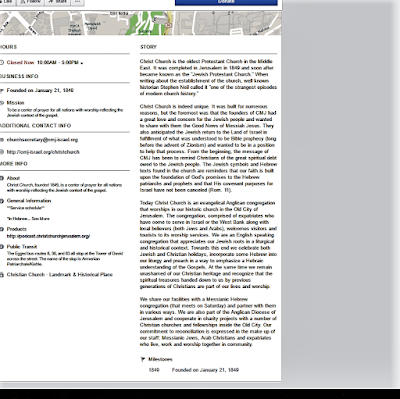 In the fight against missionaries, Wilson is a Teflon Donna. Despite her well-documented messianic past and her current friendships with overt missionaries from Christ Church, she is sanitized by Jews across the grassroots spectrum. To raise the issue is suicide for career minded activists, writers, pundits, etc. You will be castigated and called an insensitive monster. For some reason, surviving a vicious act of Arab terror (which took the life of her missionary friend and caused severe injuries to herself) gave her a get out of jail card. 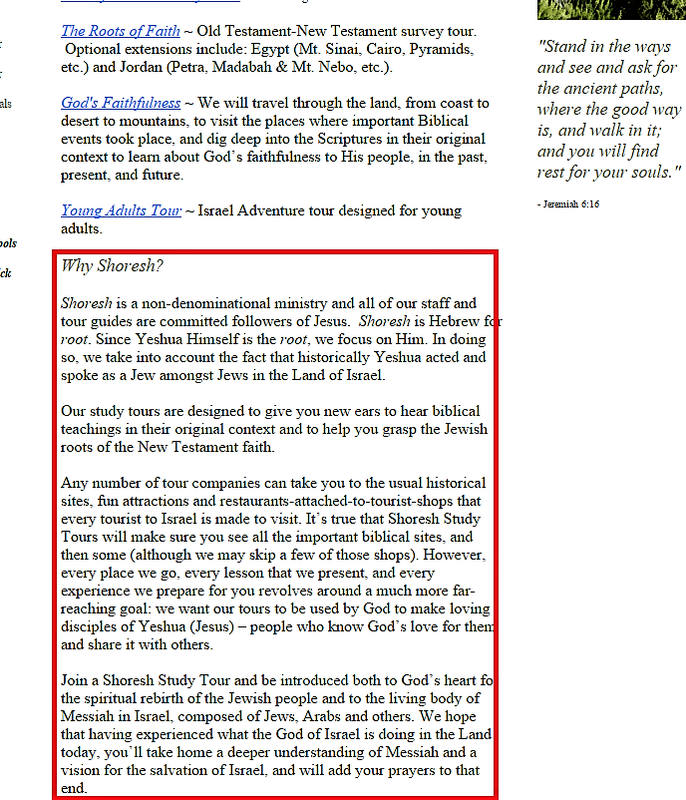 The problem is that the Torah has some harsh things to say about missionaries. 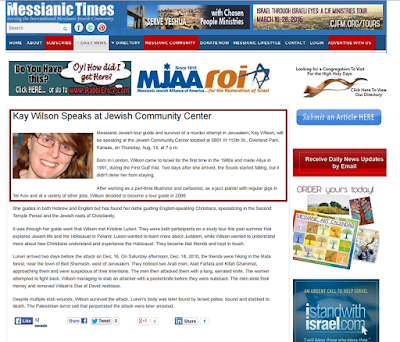 Has Ms. Wilson engaged in a teshuva process? Unlikely, since she continues to deny having any past involvement with such groups despite the OVERWHELMING evidence. The proper Jewish response to such a situation, despite it being the unpopular provocative position, is to state the obvious. Ms. Wilson needs to come clean or be called out. Whether she likes it or not, Kay Wilson cannot play the victim card to avoid questions that should trouble any self-respecting Jew. Because from a Torah perspective, a missionary is a spiritual predator. And her defenders never answer questions but resort to the standard name-calling. 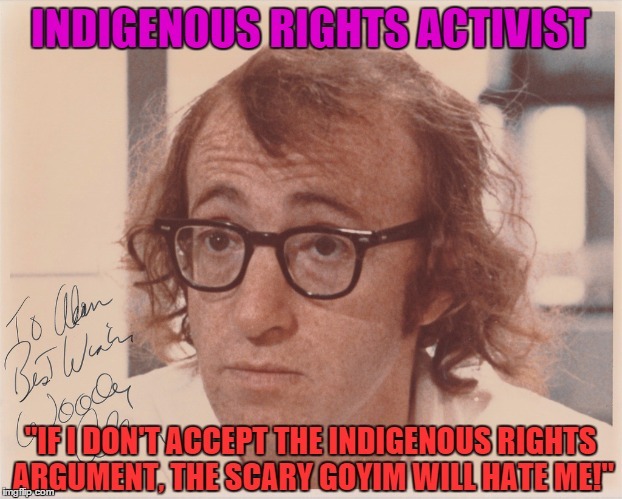 With no intention to bully, harass, or insult her, logic demands that every Jew concerned with Jewish identity has a right to demand where a public figure stands on such matters. 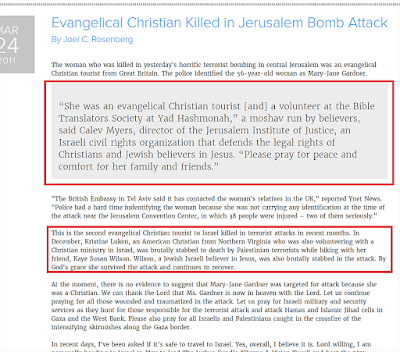 FACT: Until this day, Kay Wilson has never acknowledged that at the time of the Arab attack on her and her murdered friend, various messianic sites referred to her as messianic. Until recently, this material was all over the web, but in recent years someone sanitized her online footprint. Fortunately, the power of screenshots exceeds such ambitious efforts. Since most hasbara types are sheep, they ignore her troubling past and her refusal to clarify. The tragedy is that most Jews don't give a damn about issues that are outside their daled amot. The few who are bothered are often afraid of Wilson and the fear of lawsuits. What is the danger in asking reasonable questions? If the weaklings at Stand with Us won't screen their representatives, then the obligation falls upon the Jewish public. The following screenshots tell a story which requires some clarification. 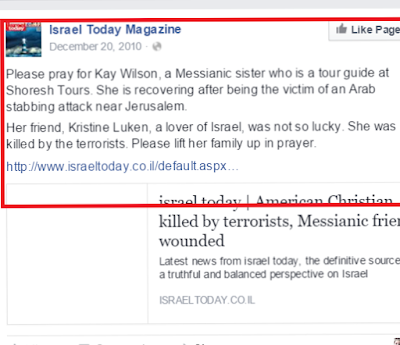 Kay Wilson owes the Jewish people a response if she cares to identify and advocate as a public figure. And to those timid ones who give her a pass, yet rant and rave about other personalities, shame on you. Your integrity is wanting. 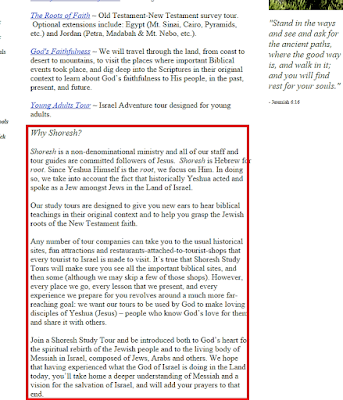 Those who claim to oppose missionaries while supporting Kay Wilson, have nothing to say on Jewish matters. Hasbara activist Yisrael Medad recently attacked a good Jew who was once ensnared in the church, and who in a genuine repentance process, dedicates his time today to protect Jews from missionaries, based upon his knowledge of such people. We know what the Torah says about one who denigrates/reminds such a Jew of their unfortunate past. But what of Medad's additional sin of being a stumbling block for the Jewish people? And the hypocrisy of his support of Wilson is astounding. 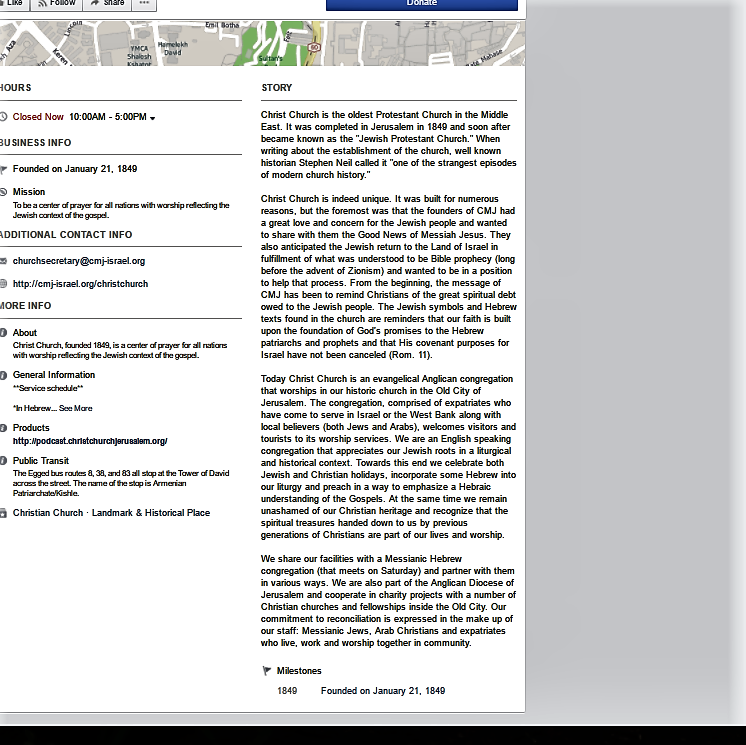 Not once has Wilson admitted her documented messianic past, or even intimated that she undertook a teshuva process. Yet she gets a pass. 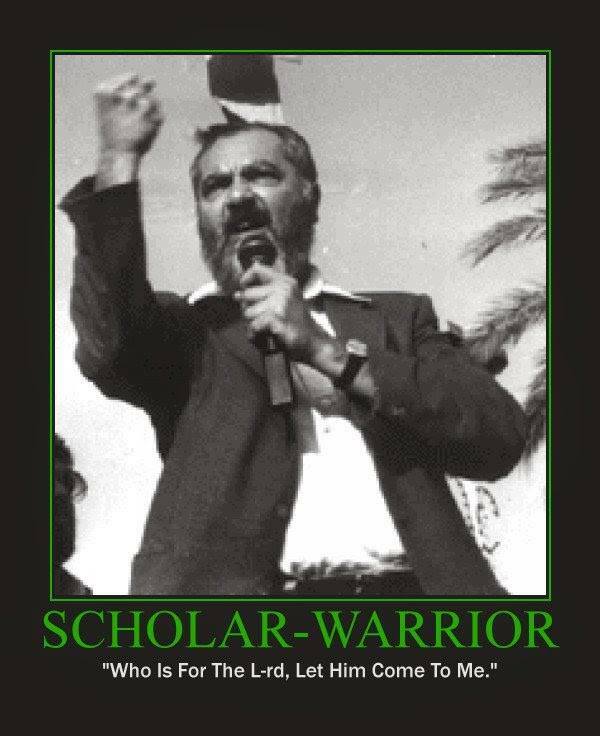 If the notorious street missionary and apostate Jew, Jakob Damkani (yemach shmo vzichro) survived a murderous attack from knife wielding Arabs, would he have the same religious supporters defending him today? Would his crude aggressive style and overt missionizing earn him Jewish enemies or would he garner their sympathy if he survived? After all, how does one differentiate between acts of Arab terror? 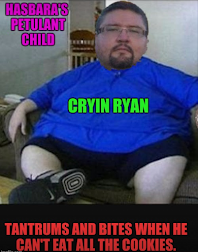 Is it the victim's demeanor? Style? Hobbies and interests? Perhaps one's accent and country of origin are factors when considering which victim is more charming or sympathetic? Does it help when one denies one's past, despite the evidence? 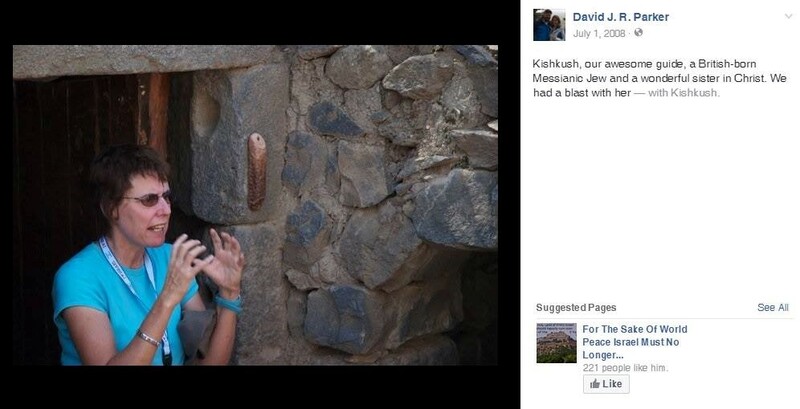 Could Damkani theoretically become a spokesperson for "Stand With Us" or speak on behalf of Israel at the UN? Food for thought, for those rare individuals who think for themselves. Kay Wilson gets away with spiritual murder, and religious social media forums like Arutz Sheva should be ashamed of themselves for allowing a forum for an unrepentant messianic. As far as those who cite Yad La'Achim to defend Kay Wilson, let it be known that they have stated different things to different people. And "The Judean Hammer's" inside YL source reports a more sobering picture, which suggests that fear rather than facts prevents the hierarchy from going after her. At the end of the day, people like Haivri and Medad support people like Kay Wilson & groups like Hayovel. 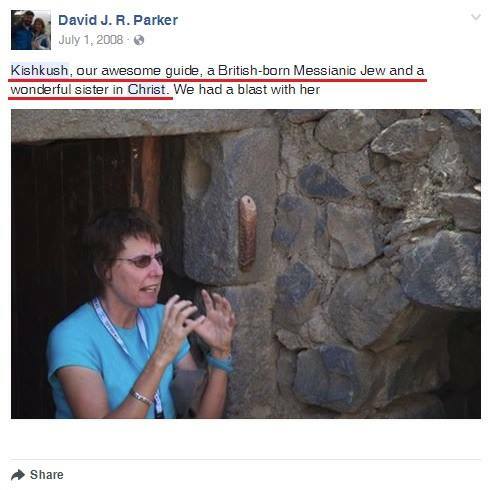 If Kay Wilson did "teshuva", and rejected and fled from her messianic past, she needs to publicly declare so, or forever remain suspect. Her failure to do so is troubling, and it suggests that she has merely become wiser. Ms. Wilson may fool many Jews, but some Jews aren't morons. A genuine penitent would unequivocally state her rejection of her past sins. Until then, logical Jews have no choice but to assume that nothing has changed, except for the mask.